This thematically charged image transcends space and time. Sorosilutu appears to be making a fascinating reference to ancient Egyptian culture and to be making a link between Egyptian beliefs and the culture of the Inuit. 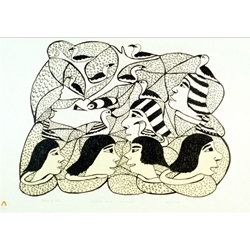 The birds perched on the heads of the Talkers of the Ocean may refer obliquely to the Falcon God image of the Egyptians, with the purpose of transcending the difference between the highly spiritual maritime culture of the Inuit and that of the Egyptians, which developed its spiritual images in a sandy land-locked environment. The Talkers seem very gregarious and in tune with the flowing rhythm of life, as suggested by the fluidity of Sorosilutu's interconnecting, all-embracing linear design. Symbolically, just one arctic fish, striped like the pharoah-like headdress of the Talkers (who are portrayed in black and white colours) floats through the antlers of the head of a caribou. The design of the antlers is mimicked by the unifying linear design. The universal Inuit culture of the ocean and the ancient Egyptian culture of the desert are juxtaposed and are shown to be somehow joined. The lower, more grounded row of Ocean Talkers is portayed in the golden tones of the sand-based Egyptian culture.